Use FELIWAY CLASSIC Refill every month to continue to create a loving and comfortable home where you and your cat will always be ‘Happy Together’. Nurtures your relationship with your cat, by creating a loving environment at home. Continuous effect, provides constant comfort for your cat. Just plug and play: screw the bottle onto the diffuser unit and plug it into an electric socket. FELIWAY CLASSIC Diffusers and Refills are sold separately. 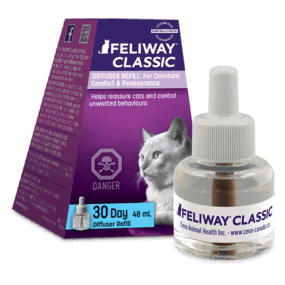 The one and only Diffuser you should use with FELIWAY CLASSIC Refill! Replace your diffuser every 6 months. To make travel and visits to the vet less stressful, and in addition to FELIWAY CLASSIC Diffuser on targeted locations.